“My food is often described as simple. This is very true, in the sense that it is not complicated, which is not to say that it is without significant complexity. In cooking, complexity can be advantageous; complication never”. Niko Romito was born in 1974 in Castel di Sangro, a small town in the Central Italian region of Abruzzo. Since 2000, together with his sister Cristiana, he’s been at the helm of the Reale, a bakery-turned-family restaurant. 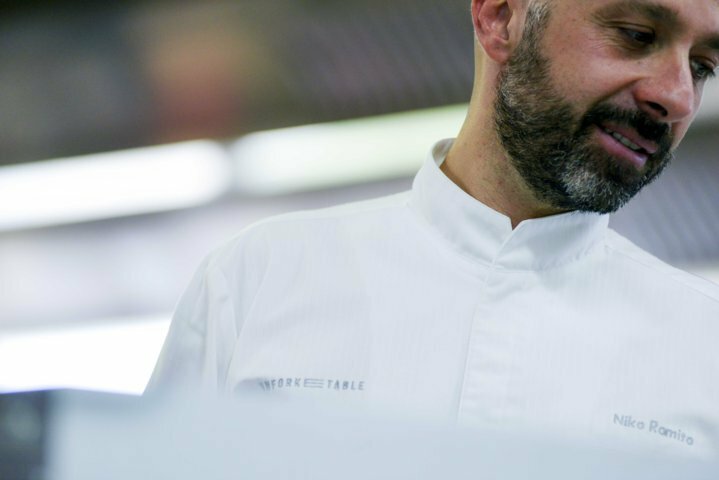 An aspiring broker, a self-taught cook, with deep ties to his territory, in just 7 years Romito has received 3 Michelin stars, followed by many more distinctions, such as the “Performance of the Year” award (with a score of 19,5/20) from the Espresso Guide in 2015, the 84th place on The 50 World’s 50 Best Restaurants in 2016 and the “Dish of the Year” award, with the highest score of “5 Hats”, from the Espresso Guide in 2017. In 2011 Romito relocated the Reale to “Casadonna”, a 16th century monastery nestled in the Parco Nazionale d’Abruzzo, together with a 9-room boutique hotel and a professional cooking school, in partnership with Slow Food. In 2013 he launched “Spazio”, a network of restaurant-laboratories run by the students and graduates of his school, a first of its kind in Italy. In 2016 he unveiled the project “IN- Intelligenza Nutrizionale” (Nutritional Intelligence), a groundbreaking, scientific food protocol designed for hospital catering, in partnership with Gruppo Giomi and the Università La Sapienza of Rome. In Romito, entrepreneurial instinct and gastronomic vision go hand in hand. As proved by his most recognized dishes (i.e. Absolute of Onion, Parmigiano and Toasted Saffron, Melting Pigeon and Pistachio, Roasted Savoy Cabbage and Potatoes), through never ending research Romito is in constant pursuit of the essential, of balance, of taste. In a very short time, he was able to forge a culinary grammar that is as unique as it is personal. On Abruzzo he says: “My luxury is to be able to live and work here”.